I was a little late bringing up the website and that is why the time on the map shows seven minutes after the hour instead of being one minute after. For the 2011 Meme, the go time is 12:01 am Eastern Standard Time. You will schedule your post to coincide with 12:01 am New York time. That means some of us will be posting on Saturday December 10th and some will be posting on Sunday December 12th. For instance, if you are a part of the meme and live in Honolulu, Hawaii (USA) your post time is 7:01 pm on Saturday night. London, England, your scheduling your post for 5: 07 am Sunday morning. 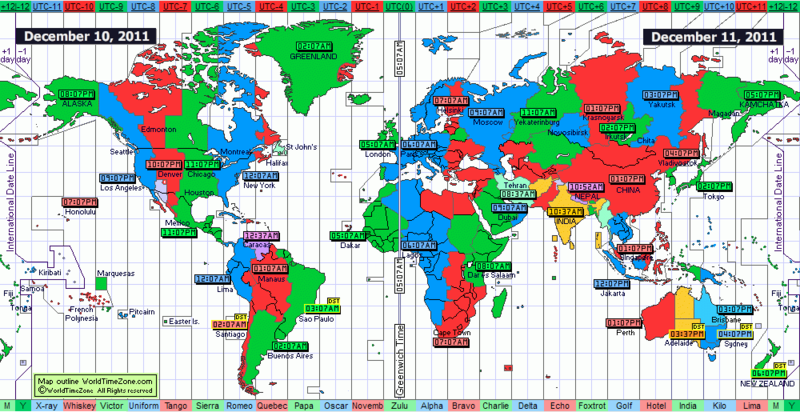 If you live in Jakarta, Indonesia, your post time is 12:01 pm on Sunday afternoon. I probably made it sound a lot more difficult than it actually is. Again, if you have any questions, let me know. Only 13 more days. My guest blogger this coming Saturday, December 3rd is Iron Cook Carl from Iron Cook: American. His personal blog has been left unattended for some time however due to some changes in his life he has agreed to add a post to Morning Erection. Carl’s post is for the wife who is married to a man who lacks romance. The post itself is dedicated to the unromantic man and one thing in particular he can surprise his wife with. The post (due to language) has a higher that Family Friendly rating. You are currently browsing the archives for the Community Network Meme 2011 category.